The X-Men face their greatest threat in DARK PHOENIX. A mission in space awakens latent powers in Sophie Turner’s character, Jean Grey. Soon, this Phoenix Force pushes Jean to dark, even evil deeds, breaking the bonds of the mutant team. The movie could be 20th Century Fox’s final film in the series that began the current superhero movie boom way back in 2000. Here’s everything we know about DARK PHOENIX. DARK PHOENIX opens on June 7. It’s been a long road to the screen for this movie. 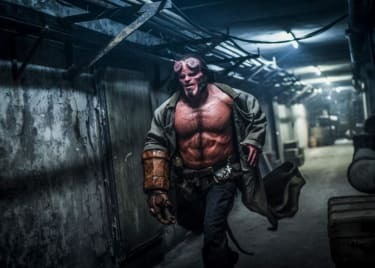 It was initially set to open in November 2018, then delayed to February 2019 in order to give the post-production team more time to finish visual effects. That date was changed again, just after the release of the first full trailer, to the current June 7 date. 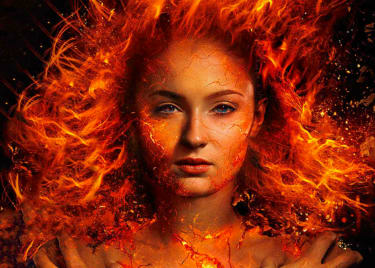 The first DARK PHOENIX trailer arrived on September 26, 2018, and the second dropped on February 27, 2019. The first sets up a lot: Jean’s repressed powers, her split from the X-Men after being taken over by the Phoenix Force, and the arrival of an enigmatic character played by Jessica Chastain. Speaking of the filmmaker, Simon Kinberg directed DARK PHOENIX as his feature debut. But he’s hardly new to the series. Kinberg wrote the last two X-MEN films, DAYS OF FUTURE PAST and APOCALYPSE, and he wrote DARK PHOENIX as well. He has also acted as a producer on the two movies featuring Deadpool. Most notably, Kinberg was one of two writers on X-MEN: THE LAST STAND, which was the first movie to tell the story of Jean Grey’s rise and fall. So, DARK PHOENIX is a do-over of sorts for Kinberg. Is Dark Phoenix Like the Comics? It’s hard to tell right now! One big difference between the comics and the new movie is Wolverine. In the original four-color story arc, Wolverine is in love with Jean Grey, who is in love with Scott Summers. Unless there’s a big surprise in store, Wolverine isn’t in this movie — his story finished in LOGAN — so there will have to be some big changes. And while the character played by Jessica Chastain does seem to be an alien of some sort, we’re not sure who she is. In the comic book storyline, a race called the Shi’ar, ruled by the empress Lilandra, played a big role. Supposedly, Chastain does not play Lilandra, however. So, if the Shi’ar are not in DARK PHOENIX, which aliens have replaced them? During a rescue mission in space, Jean Grey is nearly killed when she is hit by a mysterious cosmic force. Once she returns home, this force not only makes her infinitely more powerful, but far more unstable. Wrestling with this entity inside her, Jean unleashes her powers in ways she can neither comprehend nor contain. With Jean spiraling out of control, and hurting the ones she loves most, she begins to unravel the very fabric that holds the X-Men together. Now, with this family falling apart, they must find a way to unite — not only to save Jean’s soul, but to save our very planet from aliens who wish to weaponize this force and rule the galaxy. Setting aside questions about Chastain’s character, many details are still open to question. Jean didn’t survive X-MEN: THE LAST STAND, but we can’t even guess how the new movie will end. The latest trailer seems to clarify who the funeral pictured above is for, but Simon Kinberg also said in the interview linked above that “there are certainly other major casualties” in the movie, so be ready to say goodbye to some other characters. Sophie Turner plays Jean Grey, who in the comics and the original 2000 film was one of the original X-Men. In the current movie timeline, however, she showed up fairly recently, in 2016’s X-MEN: APOCALYPSE. The main characteristic of this version of Jean Grey is that she’s wary of her powers — and she evidently hasn’t learned to accept them in the 10 years of story time since APOCALYPSE ended. DARK PHOENIX carries her fears to an extreme end. James McAvoy plays Charles Xavier, leader of the X-Men and the founder of Xavier’s School for Gifted Youngsters. He has led the X-Men to become national heroes as mutants have been accepted by humanity, but that also puts the team in increasingly dangerous situations. While Xavier tries to do the right thing, he sometimes falls short of the mark. He put psychic blocks in Jean when she was young, to help control her powers, but that action comes back to haunt him. Michael Fassbender returns as Magneto, who has withdrawn to the island of Genosha, which he has set up as a haven for mutants. Jean seeks sanctuary there at some point, but the film’s first trailer suggests that visit does not go well. Though she’s less the star of this part of the story, Jennifer Lawrence endures blue body paint one more time as Mystique. Her character has shifted into a leadership role, and alongside Nicholas Hoult, as Beast, she helps train the younger X-Men. Tye Sheridan plays Scott Summers, aka Cyclops, the young mutant whose amazingly powerful optic beams require incredible control. He wears special glasses to contain the power in his eyes, and his own caution about his powers sometimes leads him to keep an emotional distance from others. But Cyclops is a born leader, and DARK PHOENIX may see him truly rise up in that capacity. His love for Jean will likely be the core of the movie. Alexandra Shipp returns as Storm, real name Ororo Munroe, a mutant who can control all aspects of the weather. Storm is also a natural leader — in later X-Men comic stories, she takes control of the team. 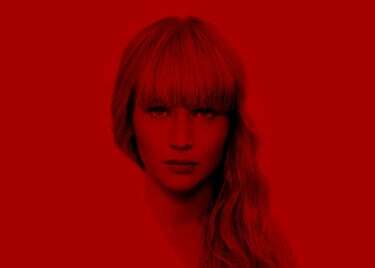 We don’t know quite how she’ll fit into DARK PHOENIX, but hopefully she’ll have a bit more to do than she did in APOCALYPSE. Kodi Smit-McPhee plays the furry, pointy-tailed, teleporting German mutant Nightcrawler, or Kurt Wagner. His gentle nature helps balance out the X-Men while his teleporting abilities are crucial to winning battles. And Evan Peters is back as the superhumanly fast Quicksilver, who discovered in APOCALYPSE that he’s Magneto’s son. He hasn’t revealed that fact to his dad yet. Olivia Munn reprises the role of Psylocke; Daniel Cudmore, who previously played Colossus, appears as well; Lamar Johnson has an undisclosed role; and Kota Eberhardt and Andrew Stehlin portray mutants Selene and Red Lotus. Come back to the AMC Scene for more news about DARK PHOENIX!